WHEN James Prinsep died in 1840, Dr Huge Falconer’s obituary, published in the Colonial Magazine, said, "Of his intellectual character, the most prominent feature was enthusiasm — one of the prime elements of genius; a burning, irrepressible enthusiasm, to which nothing could set bounds. His powers of perception were impressed with genius — they were clear, vigorous and instantaneous. The extent of his capacity was wonderful, and the number and variety of his acquirements no less remarkable." He got training in assaying and was apprenticed to the assay-master of the Royal Mint, London. 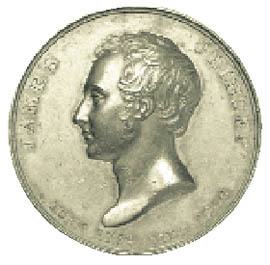 On his arrival in India in 1819, he was appointed assistant assay-master at the Kolkata mint and was soon promoted as assay-master of the Benares Mint. On reaching Benares, James Prinsep reformed the building of the mint. In addition to his official duties, he improved the drainage of the city by constructing an arched tunnel, restored the dilapidating minarets of the mosque built by Aurangzeb, conducted the city’s first census, erected a church there and prepared a balance of extraordinary precision as to indicate the 3/1000th part of a grain. He also made a series of sketches related to Benares in pencil and ink drawings that were later reproduced as lithographs under the title of Views and Illustrations of Benares. Additionally, he spared time for studies in chemistry and physics, directing his attention to the measurement of heat and wrote an article on this subject, which was published in the Transactions of the Royal Society of London. In 1830, Prinsep returned to Kolkata mint as deputy assay-master to work again under Dr H. H. Wilson, who was also secretary to the Asiatic Society of Bengal and had authored the first Sanskrit-English Dictionary. This association gave a new turn to his pursuits, bringing him into connection with the Asiatic Society. He also formed intimacy with Major Herbert, a scientific officer of the Company’s army, who had started a periodical called Gleanings in Science with the proposed object to make known in India, the discoveries made in arts and sciences. To this periodical, Prinsep contributed several articles. In 1831, Major Herbert was appointed astronomer to the king of Avadh and transferred the conduct of his periodical to Prinsep, who improved it to rival publications of the same nature in Europe. In 1832, Dr Wilson joined Oxford University as the first professor of the newly founded chair of Sanskrit. Prinsep succeeded him as an assay-master. He was also nominated to succeed him as secretary to the Asiatic Society. By merging Gleanings in Science with the society, he altered its name to that of Journal of the Asiatic Society. He encouraged the antiquarian interests of his European contemporaries in India and requested them to undertake and report on field investigations as they travelled around. The response was overwhelming and he was flooded with reports of archaeological finds, collections of coins and facsimiles of inscriptions for study and publication. He even got cooperation from unexpected quarters. Maharaja Ranjit Singh’s French General Jean Baptiste Ventura, for instance, who excavated Buddhist stupa at Manikyala, near Rawalpindi, sent his findings to James Prinsep. Similarly, Claude Auguste Court, another French officer in the Maharaja’s army, sent coins and inscriptions from Punjab to the Asiatic Society. James Prinsep now devoted himself to the study of antiquities of India, particularly to deciphering of ancient inscriptions and cultivated this branch of archaeology with a passion that carried his discoveries beyond those of his predecessors. His greatest achievements were in epigraphy and numismatics. By unlocking the mystery of both Brahmi and Kharoshti scripts and the decipherment of numerous inscriptions, including those related to Ashoka, he rightly earned his position as one of the prominent Indologists. Inscriptions on the pillars at Delhi and Allahabad, facsimiles of which were published in the volumes of the Asiatic Society’s proceedings, during the time of Sir William Jones, and the deciphering of which had baffled accomplished scholars, yielded, at last, to James Prinsep’s ingenuity and perseverance and led to a proper understanding of the chronology of historical sites and events. With these discoveries, he was brought into communication with distinguished orientalists, which produced many evidences of reciprocal esteem. Many literary societies of the West paid him the compliment of electing him a corresponding member. Institute de France also named him for this distinction. His incessant hard work made him succumb to an infection of the brain that led to his premature death, ending a glorious phase not only of Indological studies but also of the Asiatic Society.